Ryan Sagawa is a third year digital arts major and communications minor student at the University of Oregon from Hilo, Hawai’i. It’s over?! That’s the only thought that comes to mind right now while in the last few weeks of my internship with the AOL corporate events team. This internship has been the best learning and work experience of my life. Whether it was setting up for an event or doing a venue search, I’ve enjoyed doing it all. When I look back on the past few months I still can’t grasp everything I’ve been able to experience. I’ve been to a Yankee game, saw the AOL Dulles headquarters, visited high-class restaurants, took the train from Virginia to New York, went to Las Vegas for the first time, and walked through every district of Manhattan. New York City and AOL has treated me well, and it’s unfortunate that it has to end so quickly. 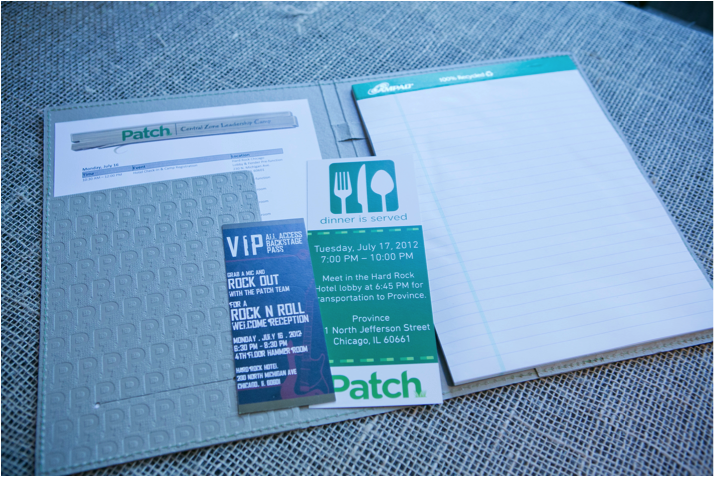 Invites that I designed and were used for Patch Camp in Chicago. Aside from the work and being in the city, I got to work with the nicest and most hardworking group of people. I don’t think most people know how much work and dedication goes into planning the events that help spread the word about the AOL brands. They are responsible for every detail imaginable in an event from the beginning stages of searching for a venue to the last stage of cleaning up after the event. Not only does it include set-up and take down they are also constantly thinking of innovative ways to present the brand through different events. Having first hand experience working with them one thing I quickly learned was that being a pro at multitasking is a must have skill being part of this team. I found myself working on 4-5 different events each day and each team member is also working on multiple events. But because we worked together as team and are able to freely ask each other for help, every event becomes a success. 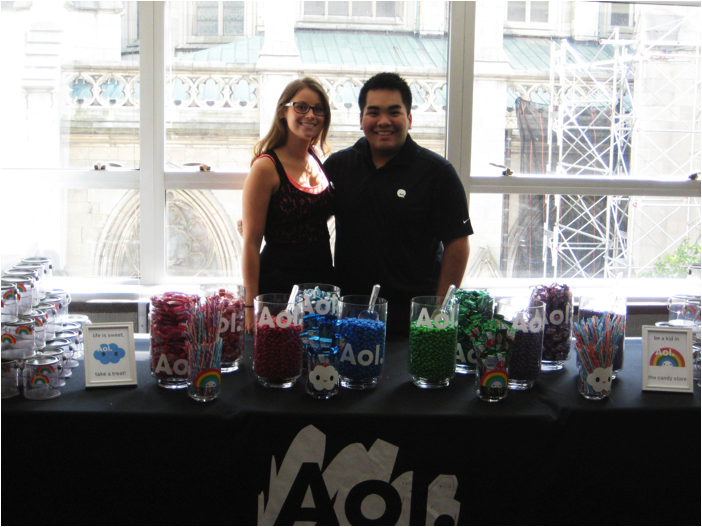 Event Coordinator Izzy and I admiring our AOL themed candy bar we put together for an event. One of their keys to success, and one thing I’m taking a way from this internship is their work ethic of “winning with grace and efficiency.” I first learned of this phrase in a meeting with the Chief Marketing and Communications Officer, Jolie Hunt. It basically means to give it your all and work hard at what you are doing and to do it with a smile. Being with the events team and AOL as a company I learned that they are working hard around the clock constantly thinking of ways to grow, but are the nicest people while doing it. This phrase made me realize that it’s the work you put out that gets you noticed, but it’s the personality and presence that makes you memorable. Which is why I think this phrase is genius, because in five words it reminds me always to work hard and be a person that others what to be around. To everyone who voted in the early stages of the about.me contest I’m so grateful and appreciative to you all. Big thank you to Lauren Bloch for being the greatest recruiter and answering all my questions. Another huge thanks to my parents for supporting me through this internship. Lastly, the biggest thank you to everyone on the AOL Corporate events team. I could not ask for a better group of people to work with and you all made my internship one I will never forget. It’s because of you all that I’ve had the best summer vacation of my life and will be leaving here a better person. I congratulate you on all the successes you will have in the future and will see you all again. Back row L-R: Karina Payton, Brandee Simoncini, Brian Virgo, Jennifer Feeney, Christopher Shebat. The AOL Corporate Events Team! This is the greatest group of people that I had the honor to work and get to know over the past two and a half months. Always a member of the team. We love you Ryan! You have made such an impact on our team this summer, can’t tell you how much you will be missed! You are an incredible person and teammate. Go Ducks! Ryan you were an absolute pleasure and I’m so glad you had the summer of your life! You will undoubtedly be missed! !